We started celebrating at Ryan's work Halloween Party. Ryan and I actually dressed up! He pretty much had too. So we chose the always easy cowboy and cowgirl. 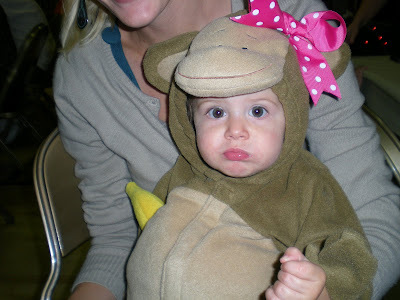 Camryn wore her costume most of the time but a stuffed sweatsuit monkey costume is not ideal for Southern CA weather. Camryn got her first tattoo, let me tell you how hard it was to get her to sit still. I think I got it to stay the second time around. Still cute with a pacifer! We woke up Saturday morning with a fresh start and I made homemade chocolate chip pancakes dyed orange in all sorts of Halloween shapes! Let me tell you they were tasty! I hope to make this a Halloween tradition. She got to have her first sucker! Now I know why all mothers give their kids them when they need to be good! She was in heaven! You could not pry that out of her grip if you tried. But at least she was willing to share. 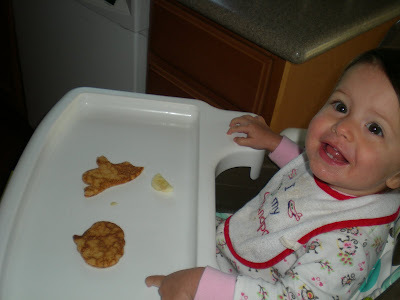 She was such a fun cute little monkey. She had fun going door to door in our neighborhood and playing with Grandpa and Grandma Smart. We finished the night off with a dance party before bed! She has increased her dance moves and I attribute it to her new little tutu! Who says you can't wear a tutu with your jamies? I can't wait until next year, each year will get more and more fun! love camryn's killer dance moves! she is one cute little monkey. Aww, that little monkey is adorable! That's fun that you took her around to houses. It's true, it just gets more and more fun each year. Love her dancing, she's totally on beat too. Better get her in dance class early! Too much fun for a little monkey! What a cute one! Suckers are the best and I know what you mean about the grip. But she would share-that shows good character. Love the dancing and the tutu with jammies! Be sure you bring that song to Hawaii so we can have a dance fest too. Hold up... did you cut your hair? Fun times. She was the cutest little Monkey. And she must have been hot because even Brielle was hot in her costume! Love the dance! I love that she puts her hands in the air! Oh my cute little monkey! I love her in it. 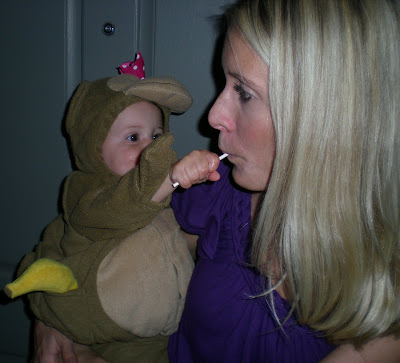 And totally loving her first sucker - I was so good with Jake too, Halloween was when he had his very first sucker too. I'm happy that you and Ryan dressed up. Me and Patrick were Cleopatra and Marc Antony for our couples party - I had cool eyelashes! Her tutu and dance moves are crazy cute! Hey, is your hair cut? Rockin' costume Camryn. Baby Ty was a monkey as well, and my stupid cat Climber was a banana. They all could've been one happy monkey family! Ry, can you even imagine throwing a kitten dressed in a banana suit at someones face? Love it. 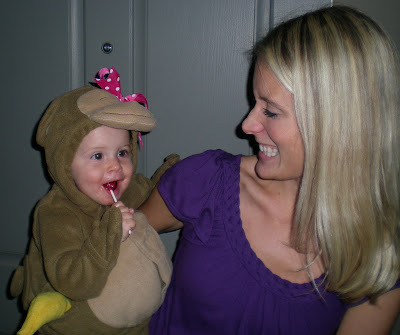 You have GOT TO BE kidding me with this monkey costume... I CAN"T HANDLE IT!! Her dance moves are amazing, much like mine when I hear Lady Gaga. 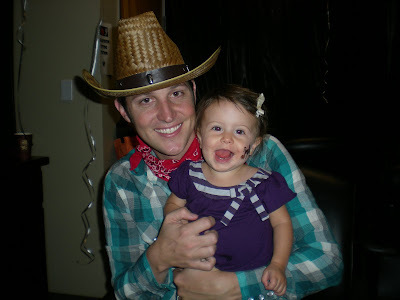 Um, what is with the drunk cowboy holding your baby... JK Ryan. But seriously, what is with your eyes?! :) You know I love you.... PS The new shoes are super cute. You need to call me and give me an update on how the parties are going. And when are you guys heading this way? It has been too long!! Ryan, what were you thinking with the wacko halloween outfit?? ?